For decades, scholars and archaeologists have worked to resurrect the history of Seneca Village, a predominantly African-American community that existed before Central Park was created. Located on the west side between 83rd and 89th Streets, it was home to the largest number of African-American property owners in New York before the Civil War. 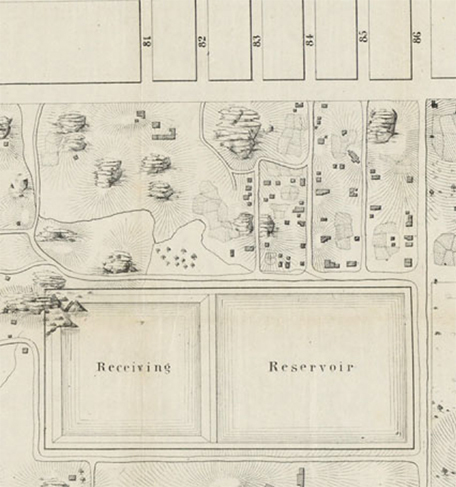 Detail of map documenting the pre-Park landscape, including the settlement of Seneca Village, a predominantly African-American community that existed before Central Park was created. Egbert Viele, Map of the lands included in The Central Park, from a topographical survey, June 17, 1856. Courtesy of the NYC Municipal Archives. When New York City built Central Park, Seneca Village residents were evicted through the process of eminent domain, along with about 1,400 other people living on the land slated for the Park. The land was cleared of houses and other buildings, which seemingly erased all physical traces of the Seneca Village community — until 2011, when an archaeological excavation of the area uncovered significant remains. 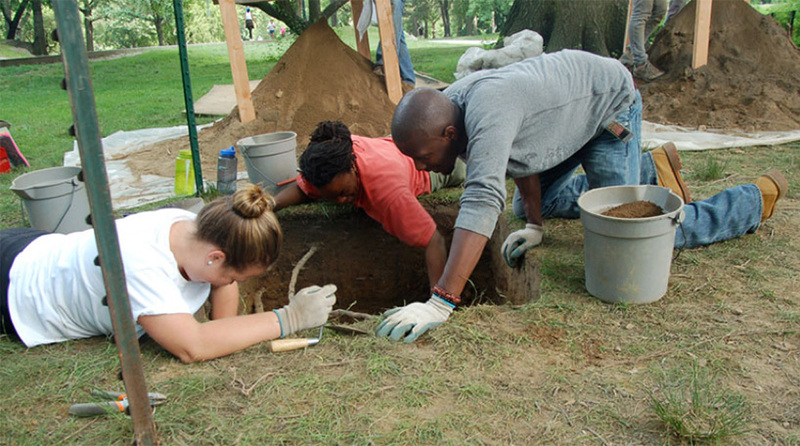 Over the course of two months, archaeologists and students collected several thousand artifacts, including household items of Seneca Village residents and the remains of their homes. Here, two of the archaeologists, Nan Rothschild and Diana diZerega Wall, share what they have discovered about this community and how archaeology can provide a tangible link to the lives of Seneca Village residents. 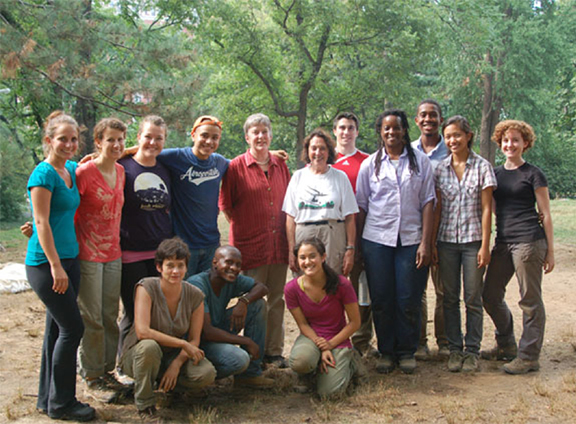 Archaeologists, including Nan Rothschild (back row, sixth from left) and Diana diZerega Wall (back row, fifth from left), and students collected several thousand artifacts at the site of Seneca Village. Photo courtesy of the Institute for the Exploration of Seneca Village History. What first drew you to Seneca Village, and what did you hope that archaeology would help illuminate? Diana diZerega Wall: I first heard about Seneca Village in a 1993 newspaper interview with Betsy Blackmar, one of the authors of The Park and the People: A History of Central Park. That book brought Seneca Village back into modern memory. I had just started teaching archaeology at City College, and the idea that traces of the village could have survived in the Park as an archaeological site was a wonderful “what if…” story. I began to explore the idea of digging there. I felt that an excavation at the site would provide a broader and richer view of the history of the African-American presence in the North and in New York City in particular. It would also help bring the history of middle-class African-Americans into the modern narrative of the nation’s history. Nan Rothschild: I was asked by Diana to participate in the project. I was excited at the prospect of investigating an unknown type of community, which turned out to be very distinctive as a middle-class African-American and Irish Village. I hoped that through archaeology we would be able to get insights into the lives of residents. I was also interested in the fact that it was a mixed community as historians tell us that these two groups did not have good relationships with one another. 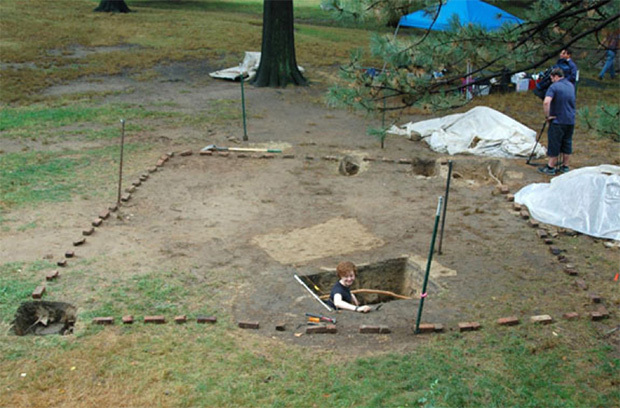 During the 2011 excavation, archaeologists and students discovered household items of Seneca Village residents and the remains of their homes. Photo courtesy of the Institute for the Exploration of Seneca Village History. What are the challenges of researching a 19th-century community of African-Americans and Irish immigrants? DW: These marginalized groups are typically not well documented. But once we began to look, we discovered that there were many more — and better — documents than we expected. For example, there were detailed maps made of the whole area that the City was appropriating for the Park, and these included the village. 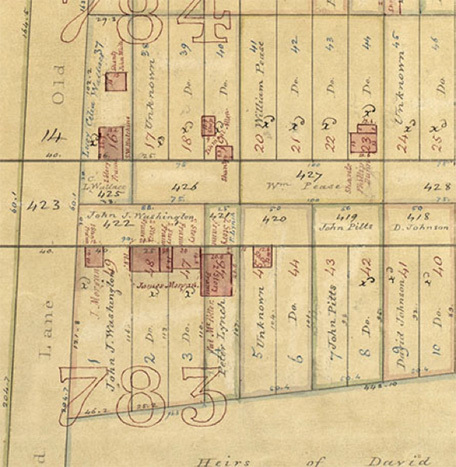 There were also detailed New York State census records from 1855 — just a couple of years before the village was razed. There were also records from one of the three churches that were located in the village. However, these were official records that did not tell us much about the dreams and fears of the people who had lived in the village, or about their daily lives. We did not have diaries or letters left by the people of Seneca Village, and most of the descriptions that we had of the village and the people who lived there were discriminatory. Detail of map created to document who lived on the land slated for the Park. The map has the names of owners or property as well as those who rented from them. Gardner A. Sage, Central Park Condemnation Maps, 1856. Courtesy of the NYC Municipal Archives. How did you know where exactly in the Park to dig? DW: We knew where the village and its buildings had been in the Park because we were able to superimpose detailed maps of the village over maps of the modern Park. Once we knew where the village had been, we were able to use several techniques to look more closely at the areas where there were most likely archaeological remains (areas where there had been houses, for example). One of those techniques involved taking soil borings, which sampled the soil in different parts of the site and told us where there seemed to be layers of soil from the village that had not been disturbed. Another was ground penetrating radar, which sent an electromagnetic pulse down into the ground and measured the density of the soil in the areas where the soil borings indicated there were intact layers. Any differences in density in the ground indicated that there was something different under the soil in that area as compared to other areas — perhaps floors of old buildings or privy shafts from old outhouses still present in the site. What do the artifacts tell us about the lives of Seneca Village residents? DW: One of the most significant excavation sites during the 2011 project was the house of William G. Wilson. He was an African-American, lived with his wife and eight children, and worked as a sexton in one of the local churches, All Angels’ Church. We were able to compare the dishes found in the Wilson House with those of their middle-class white contemporaries who lived in Greenwich Village, where we had done earlier excavations. We discovered that while the middle-class white families used dishes from sets that matched each other, the African-American Wilsons also used dishes with printed images that did not match — they were not from sets. We think that this could mean that they spoke a different “language of dishes” than their white middle-class counterparts. Alice Baldwin-Jones, an anthropologist of African descent who grew up in Belize, recounts that her family did not use matched dishes for everyday meals; instead, each individual family member used his or her own individual dish. Under this system, the dishes used by the household members cannot match, or family members would not be able to tell which plate belonged to whom. This custom of using personal dishes (and, in Belize at least, the use of personal silverware and chairs) may have been prevalent among many American and Caribbean families of African descent. Baldwin-Jones offers a possible explanation for this phenomenon: “In the face of slavery where people of various cultures were brought together as property and [were] treated as less than human, [one was forced] to create an identity for oneself ... [a] sense of individuality that would lead to using unmatched dishes, and other personal items to create such an autonomy.” Perhaps the importance of individual improvisation in jazz, the quintessential African-American art form, is another expression of this phenomenon. 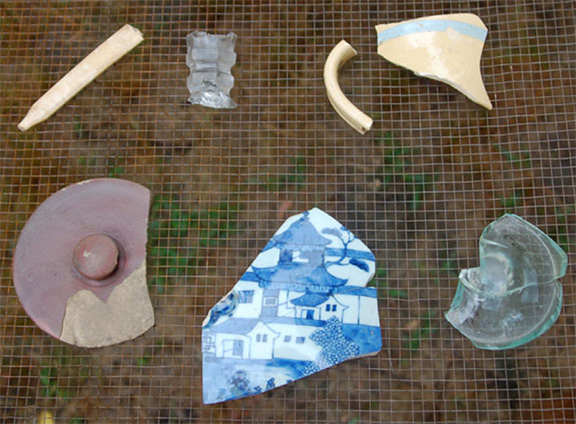 Various artifacts discovered during excavation of the Wilson house. From top left and moving clockwise: handle of a bone toothbrush; glass fragment from candlestick or lamp; handle and body fragments of a yellowware pitcher; base of a bottle, possibly for wine; fragment of Chinese porcelain vessel; stoneware jar lid. Photo courtesy of the Institute for the Exploration of Seneca Village History. You also found remnants of some of the buildings. What do these tell us about the homes of some of the Seneca Village residents? DW: We learned about the houses in Seneca Village from both what we found in the excavations and what we didn’t find. The excavations revealed that the houses were built on stone foundations, and we inferred from the number of nails we found that the upper parts of the buildings were made of wood. However, we did not find much wood, a discovery which we interpreted as meaning that people probably took the boards that formed the siding of the houses and recycled them into other buildings. We also found a lot of iron sheets or tiles, which we think might have been the roofing for many of the houses. One of the most significant excavation sites was William G. Wilson’s house, where he lived with his wife and eight children. This is the footprint of the house marked in bricks. Photo courtesy of the Institute for the Exploration of Seneca Village History. DW: For me, the most surprising discovery was that so much of this archaeological site was intact in one of the most heavily utilized public spaces in the City. NR: What struck me was that this was a really rural area, compared to where we had dug before in lower Manhattan. It had fewer artifacts and less complex soil layers. How does Seneca Village compare to other archaeological excavations you have worked on in New York City? DW: There were many fewer artifacts than we usually find on urban sites in New York, where considerably more people lived over a longer period of time than they did at Seneca Village. The village was only occupied for about three decades — a far cry from the more than three and a half centuries of habitation in lower Manhattan. Of the thousands of artifacts you uncovered, do you have any personal favorites? DW: My favorite artifact is the child's shoe that was uncovered in the Wilson house. It is so personal — it evokes the child who lived there and makes him or her come to life. 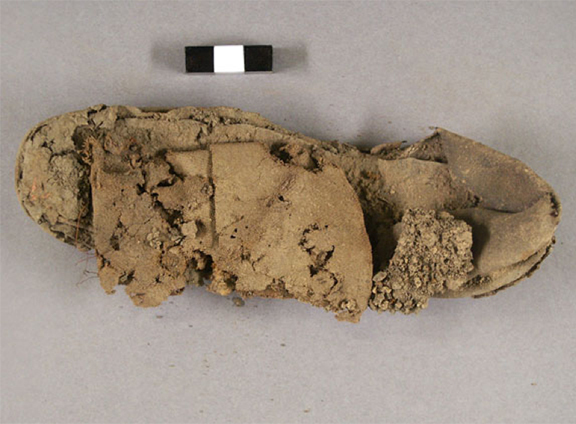 A child’s shoe was one of the artifacts uncovered during excavations at the Wilson house. The upper part of the shoe is made of fabric, while the sole is leather. Photo courtesy of the Institute for the Exploration of Seneca Village History. NR: My favorite artifact was the teapot, a beautifully designed, graceful, and elegant piece, showing the tastes of some in the community. 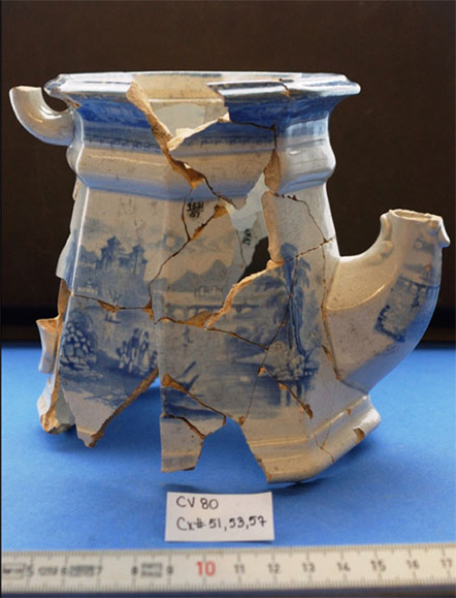 This teapot was found near the site of Elizabeth Harding’s house. It is Rothschild’s favorite artifact discovered during the excavation. Photo courtesy of the Institute for the Exploration of Seneca Village History. Nan Rothschild is an Historical Archaeologist and Professor at Columbia University. She has done fieldwork in New York City and New Mexico. She is the author of New York City Neighborhoods, the 18th Century; Colonial Encounters in a Native American Landscape; The Archaeology of American Cities (with Diana Wall); and many articles. Diana diZerega Wall is Professor Emerita at the City College and the CUNY Graduate Center. She specializes in the archaeology of New York City, and has looked at the construction of gender, race, and class in the city from the 17th through the 19th century. Her books include Unearthing Gotham (with Anne-Marie Cantwell) and The Archaeology of America's Cities (with Nan Rothschild).